Join us for a cocktail reception on Sunday, October 14 from 5 to 7 pm at Wee Burn Country Club where you can meet & talk with CT’s State & Local Republican Candidates before the November elections! The list of attending GOP candidates will be announced soon. The cost is $25 per person and includes hors d’Oeuvres and open bar . Tickets are on sale now at www.DarienRTC.com or you can click HERE. All registered voters are invited to attend, regardless of party affiliation! Wee Burn Country Club is located at 410 Hollow Tree Ridge Road Darien. 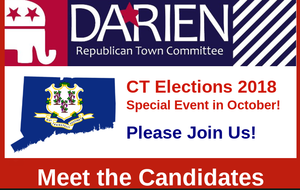 meet & talk with CT’s State & Local Republican Candidates before the November elections! or you can click the button below.